MWBE Connect NY is a revolutionary new way to connect New York City and State MWBEs to business opportunities with government. 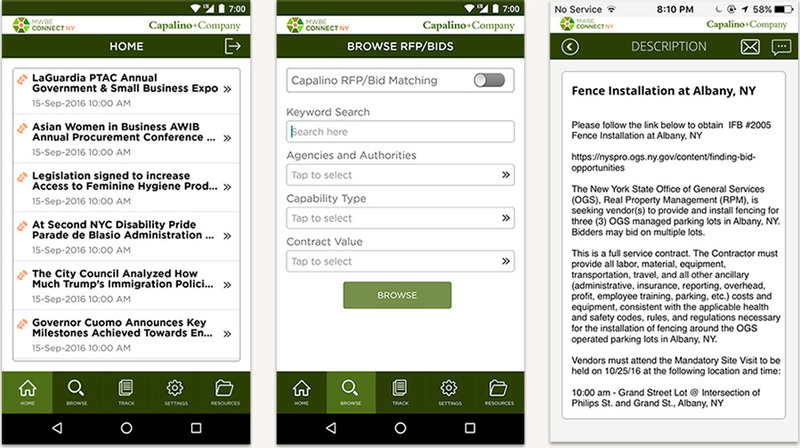 This app provides users with unprecedented access to the MWBE services offered by Capalino+Company at a fraction of the cost. MWBE Connect NY provides streamlined access to current New York City and State request for proposal (RFP) listings by industry, and includes a comprehensive suite of business tools to track and manage these business opportunities. What can you do with MWBE Connect NY? Already downloaded the app? Purchase a subscription today, before your free trial runs out!